Yes, Quartzsite, Arizona, is home to one of the largest rock and gem showcases in the world! 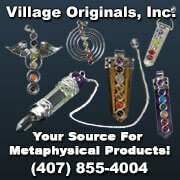 Quartzsite is home of one of the largest rock and gem showcases in the ... World! 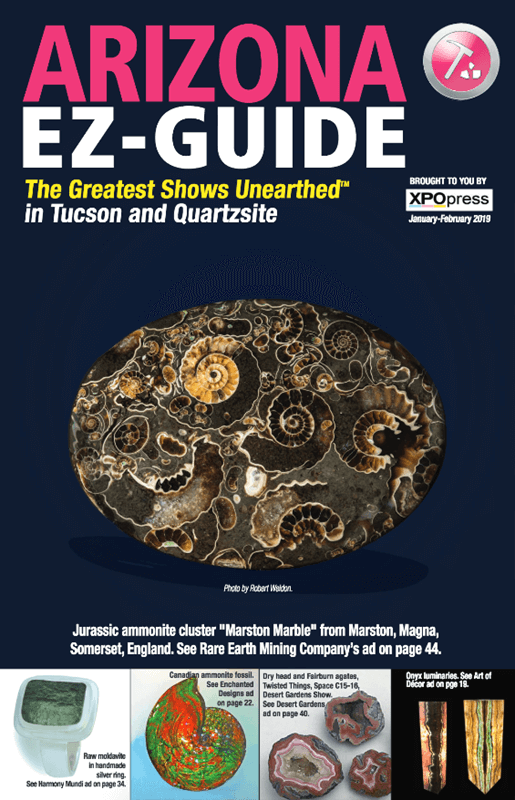 That's right, little Quartzsite hosts one of the largest showcases of its kind not just in the U.S. but in the world. Read Brad Hicks' article in the International Gem Show EZ-Guide ("Gem 'Showcase' Towns of the United States," p. 16). 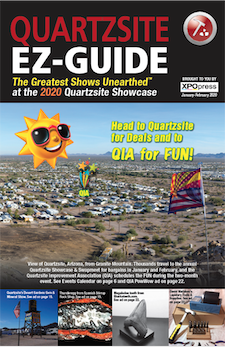 Over 400 rock, gem, and mineral dealers pack up their trucks and RVs and head to Quartzsite every winter to sell at the four big rock and mineral shows there — the Desert Gardens Show, Tyson Wells Show, QIA Pow Wow, and Prospectors Panorama. Simultaneously, the nation's "real" rockhounds also flock by the tens of thousands to Quartzsite during show time to not only buy treasures but to also meet up with age-old friends at this annual reunion of tried-and-true rock lovers. And Xpo Press? Well, as everyone knows, where there are lots of rocks and minerals being bought and sold, Xpo Press is right there assisting the show promoters, dealers and vendors, and local businesses with effective, affordable online and print advertising (both free and paid); at the same time Xpo Press publishes helpful guides for the show-goers and this unparalleled gem-show website to help them navigate every aspect of the shows. This is the Official Guide to the annual Quartzsite Showcase & Swapmeet. The full-color, 25,000-circulation Quartzsite EZ-Guide promotes the 10 shows and various swapmeets open for business every December thru February — publishing show dates, hours, addresses, contact information, floorplans and maps, and a complete list of every dealer and vendor at the shows, and some great articles for readers to enjoy. This guide is distributed on special racks at all of the shows and many local businesses during show time each year. Ad rates for this guide. Full-page/$1,290 • 1/2-page/$832 • 1/4-page/$520 • 1/8-page/$319. Discounts range from 3% off to 50% off. Contact Xpo Press to see what discounts you qualify for.